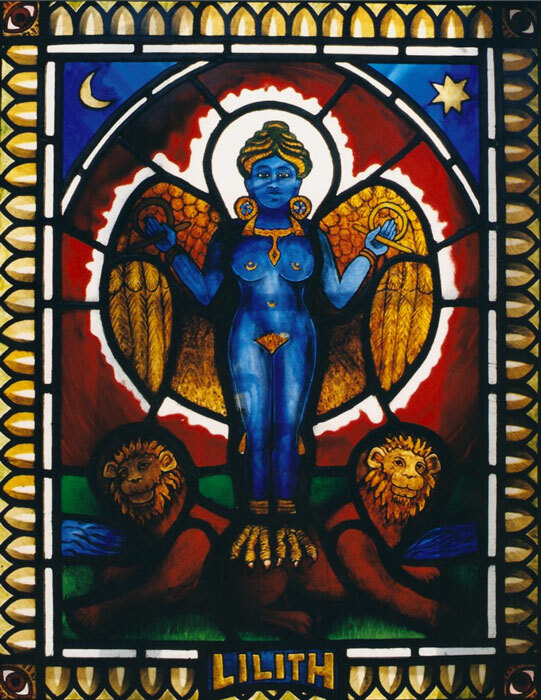 Lilith was the Judaic name given to the Sumerian Goddess Innana / Ishtar whose powers were associated with animals and the knowledge and creative force of instinctual sexuality. A clay relief dating from 2,000 BC shows winged Innana / Ishtar wearing the horned head dress that denoted divinity and standing on the backs of two lions. Animals as vehicles is common to many ancient deities and still seen in Hindu Gods and Goddesses. So powerful was the cult of Ishtar – with its emphasis on sexuality and the independence of women – that while the Jews dwelt in Babylon the Judaic tradition had to demonise the image to prevent its adherents from being seduced away from the true faith. In Jewish myths written long after Genesis she becomes the ‘bad’ first wife of Adam, who was created from the same dust at the same time but refused to be subject to him sexually or spiritually and demanded equality. She escaped into the desert by uttering the secret name of God and is reputed to haunt the night, tempting men in their dreams and fathering demons from their spilt seed. 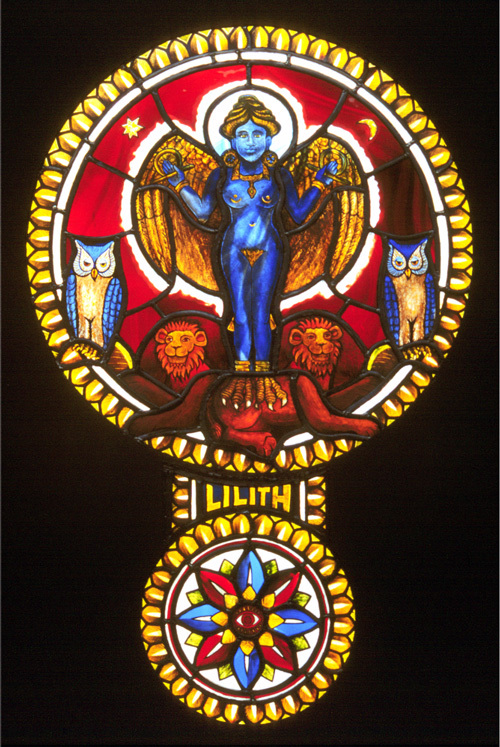 Lilith is shown holding symbols of power – the rod and circle in a form similar to the Egyptian ankh which meant ‘life’. Innana is attended by two owls that symbolise her association with the night and the power of darkness and the unknown. Her name comes from the ancient non-Semitic Mesopotamian word ‘lil’ meaning breath or spirit of life in the sacred sense. Lilit were spirits of the night. Lilith’s positive connection with life and conception was sacrificed to the new patriarchal order and her name became synonymous with all demons and the dark. However when we look at her attendant owls we might surmise that somewhere her memory is preserved in our folklore image of the owl as wise bird of the night. Lions have always been solar symbols and thus part of a masculine mythology. Here they are her vehicle and means of support but as much as she is carried by them she also keeps them ‘down to earth’. Thus masculine principles can inform and direct the physical world rather than merely soaring unchecked, as they do today, in the realm of ideas; unable to control the dangerous aspirations that greed and lust for power have created in a world that we once respected as ‘holy’. Lilith, with her beautiful body and bird’s wings, soaring from clawed feet that are anchored in two lions is a powerful symbol of an ancient wisdom that was rooted in the real world of earth and instincts in a way we no longer understand. Lilith represents a wisdom that comes from understanding of those instinctual forces that in the crisis of our present society we no longer know how to either respect or govern.